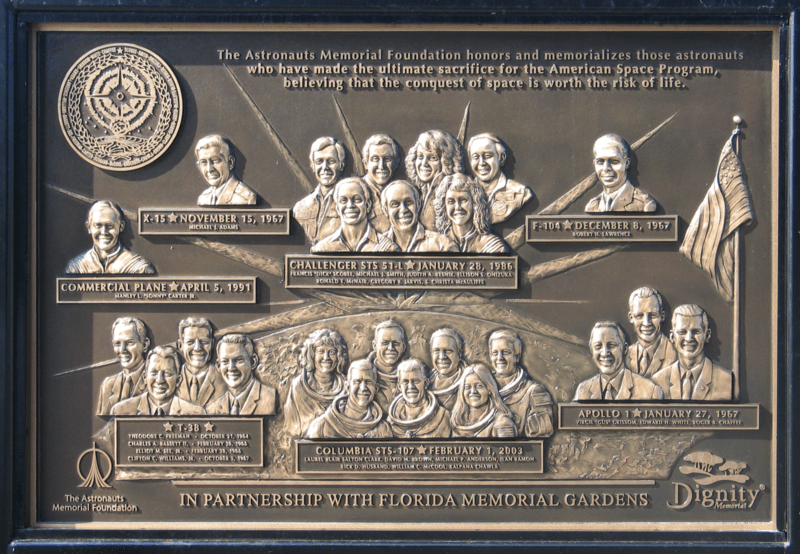 The Astronauts Memorial Foundations’ Dignity Memorial commemorates NASA’s fallen at Kennedy Space Center (Credits: Seth Buckley). In a coincidence nearly odd enough to make even a rocket scientist wonder about fate, all three of NASA’s multi-astronaut fatalities occurred within a span of six calendar dates. Over the course of this week, we will take a moment to look back and learn from these safety failures on the anniversaries of the losses of Apollo 1, Challenger STS-51-L ,and Columbia STS-107. The first such accident occurred on January 27, 1967. Astronauts Gus Grissom, Edward H. White, and Roger B. Chaffee died of asphyxiation in a fire while undergoing a plugs-out test in their Apollo 1 capsule. The test had been perform numerous times before on Mercury and Gemini capsules, always pressurized with 100% oxygen. There was a reason for the choice of atmosphere: it was necessary to simulate the pressure differential the capsule would experience between its life sustaining interior and the vacuum of space. Using an oxygen atmosphere simplified preparations for extravehicular activities and even some pressure-plummeting portions of ascent, when any nitrogen in the blood stream could lead to decompression sickness. NASA was also anxious to avoid repetition of a prior incident when use of a mixed-gas atmosphere resulted in too little oxygen being provided to test pilot G.B. North, who lost conciousness and sustained serious injuries. NASA failed to recognize that simulating the pressure differential on the ground produced a much more hazardous situation than in space, since an internal pressure of 16.7 psi was needed instead of the operational 5 psi. The plugs out test was not designated as hazardous, apparently despite warnings to that effect from the capsule’s manufacturer, North American Aviation. At the time, only tests involving hypergolics, cryogenics, and pyrotechnics were deemed hazardous. The lack of such a designation meant that the entire test received less scrutiny and there were no response teams on hand to deal with exigencies. No one was prepared when a spark under Grissom’s feet flared into an all-consuming fire within seconds. The astronauts had been having trouble communicating with Mission Control throughout the plugs-out test, and the latter wasn’t sure what was going on until a half-garbled message from an unknown crew member and high pressure readings led them to take a look at the monitor covering the capsule’s small window; it was filled with flames. Design factors made it impossible to open the hatch under such conditions from either side, and all three astronauts died when their oxygen feeds were disconnected. It took half an hour for rescuers to get within armslength of the flame-shooting capsule. A year later, the USSR would reveal that they, too, had lost a cosmonaut to an oxygen fire when Velentin Bondarenko died in a high oxygen isolation chamber on March 23, 1961. Tomorrow, we’ll take a look at the loss of the Space Shuttle Challenger on January 28, 1986.